Note: This app, and the associated website have been offline since 2012. The GitHub project may still be useful to you. There have been several requests on Meta Stack Overflow for a way to get a combined flair similar to what is shown on Area 51. I took a "I want it, I'll make it" approach. Thus became StackFlair. Area 51 is currently excluded as the site is not included in the API. The default output is HTML to support linking and titles for the elements contained in the flair. You can also get image output. I provide a very simplistic UI for selecting a Stack Exchange site and inputting a user id. The generated content can also be linked to directly so that you can use the URL anywhere you can embed an image or pull dynamic HTML. Several options are available: themes, excluding beta sites, using a single site or combined flair, HTML or image output. I am very open to more feature requests regarding customization options, theme, and layout. Your StackFlair data is stored for 12 hours. When you visit the StackFlair homepage and enter in the details, you will be redirected to a direct flair link which you can use from then on. StackFlair has been tested in Internet Explorer 8, Firefox 3.6, Chrome 7, and the mobile version of Safari (iPhone). Please report any bugs, feature requests, and issues at the StackFlair GitHub project. I am happy to do even the smallest of requests, such as My blog colors are <x>, can you use that in a theme for me? StackFlair is an ASP.NET website written in C#. The Stacky library is used for API access. The project is hosted at github.com/rchern/StackFlair. Note that your account-id is the numeric ID in the URL for your profile on the main stackexchange.com website. Thee is now a wiki page on GitHub showing usage examples. I've committed the code and will be cleaning it up and commenting it soon. I'll be adding more themes, so if you've got some color schemes in mind, head over to the GitHub site. Any feature suggestions (and bugs...I suppose) are welcome. I've implemented my ideas, so let's hear yours. somee.com will not be my host for much longer. StackFlair.com is coming soon! Its really broken right now. I as @Basic mentioned auto-complete drop-down disappears after the first key press. 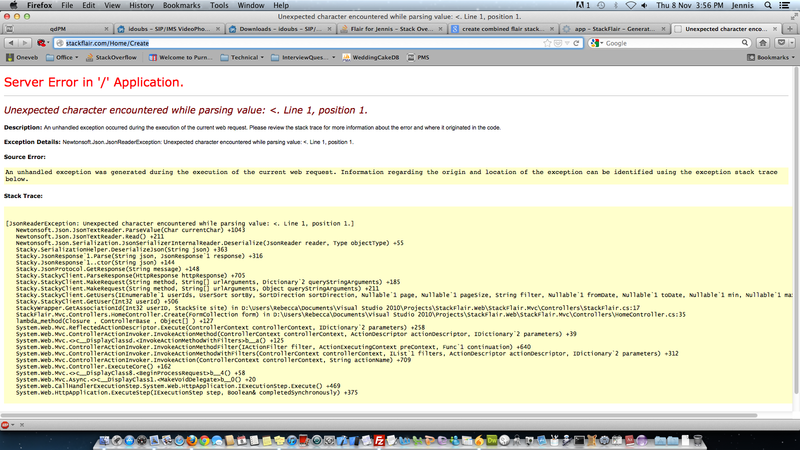 And also after submitting I too got same exception System.Exception: Favicon file does not exist, see image attached. Please try to fix it as its really awesome idea. When entering a username, the auto-complete drop-down with Gravatars disappears after the first key press. Not the answer you're looking for? Browse other questions tagged app website flair . OBSOLETE - StackImage 2 - Create Your Own Unique Custom Flair! Good looking, higher quality Stack Exchange flairs!